Mr. Pridgen represents local governments, housing authorities, and regional businesses. Mr. Pridgen’s areas of practice have included handling cases in both federal and state courts and before administrative and regulatory agencies. Mr. Pridgen presently serves as legal counsel for eight Eastern North Carolina municipalities as well as the Wilson Housing Authority. 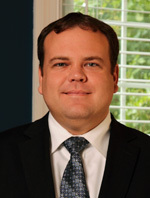 Mr. Pridgen also serves as Vice-President of Cauley Pridgen, P.A.